This is the story of Near Neighbours first small grant and the friendship that has continued to blossom and flourish since. 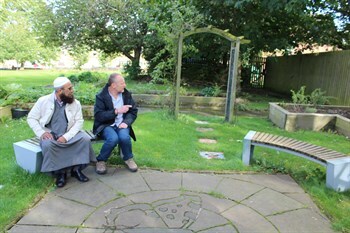 St. Stephen’s Church in Bradford is just down the street from a local Mosque, and so the neighbouring vicar – Jimmy, and secretary of the mosque – Rifaqat, got to know each other, and even worked together on a drug and homeless project. The church applied to Near Neighbours for a small grant for the purpose of a storytelling space to bring together people of different faiths from the wider community. The application was approved and this became the first ever Near Neighbours grant. The storytelling initiative built on the existing good relationships with the mosque and local schools, and with their help, reached out to the wider community. The storytelling facilitated the exchange of cultural ideas and traditions and lead to increased understanding and cohesion. Since this project, Rifaqat and Jimmy have continued to work together focusing on common values, and have also become fast friends. They have been working together for 7 years and show no signs of stopping, currently discussing new projects to collaborate on. They are also there for each other in difficult times and choose to bring people together as a community. For example, when the Finsbury Park attack occurred, Jimmy joined the prayers at the mosque and prayed with them.